My Geeky Geeky Ways: Arrow Episode Guide: Season 4, Episode 11 - A.W.O.L. Arrow Episode Guide: Season 4, Episode 11 - A.W.O.L. John will need to learn to trust his brother Andy once again, when an enemy from their past - a soldier they both served with, turned agent of the criminal organization Shadowspire - arrives in Star City. Meanwhile, Oliver and Felicity begin to rebuild their life together in the wake of Felicity's paralysis. But Felicity suffers a crisis of faith in her abilities, made manifest as medication-fueled hallucinations of her black-hat hacker past self. John Ostrander's Suicide Squad (the covert feeling of the story, dealing with clandestine government organizations and the presence of Amanda Waller), Chuck Dixon and Gail Simone's Birds of Prey (the issues Felicity is going through mirror those Barbara Gordon coped with regarding her paralysis, the code name Oracle is name dropped by Oliver) and the Deathstroke & Damage comics of Tom Joyner (The Shadowspire organization). It seems like removing the retinal patterns of a dead agent from your locks would be Priority One in an organization like ARGUS, with a leader as paranoid as Amanda Waller. This should be doubly true when they know that said agent's body had an eye missing when his body was found! As usual, when given the center stage for an episode, David Ramsey proves himself more than capable of holding the show. Scenes of a medicated character talking to their past self are a common cliche, but Emily Bett Rickards' twin performances here make the material work in spite of itself. The combat sequences during the Afghanistan flashbacks are effectively shot. The special effects allowing the two Felicities to interact are of cinematic quality. Shadowspire is a criminal organization in the DC Comics Universe. They first appeared in Deathstroke #53 and were created by writer Dr. Tom Joyner and artist Mike Collins. Shadowspire worked with South American drug cartels, providing them with weapons, transportation, intelligence and technology as well as trained agents with advanced armor and metahuman powers. Their technology was advanced enough that they were able to develop unique weaponized viruses. The DCTVU version of Shadowspire is a similar criminal syndicate who like to recruit members from active military organizations. This leads ARGUS to the faulty conclusion that Shadowspire is merely a US Army Special Forces team that had turned to war profiteering. The symbol/logo for Shadowspire used on the show - a red diamond with a smaller black diamond in the bottom corner with a red triangle within the black diamond - is taken directly from the comics. Lieutenant Joyner - the soldier who recruits Andy Diggle into Shadowspire in the flashbacks and leads the attacks on ARGUS in the present - is named in honor of writer Dr. Tom Joyner. Shadowspire's leader in the comics was Baron Reiter, whom the main villain of the flashbacks on Lian Yu this year is loosely based upon. When Oliver gives Felicity the code name Overwatch, he says he had considered the name Oracle but it was taken. This is, of course, a reference to the code name of the original paralyzed master hacker - Barbara Gordon. Whether this is meant to be an indicator that Barbara Gordon exists as Oracle in the Arrowverse or if this was just a fourth-wall breaking gag regarding how notoriously protective DC Comics is regarding Bat-family characters being used in other franchise or the accusations of Green Arrow continually ripping-off Batman is up foe debate. Felicity's new code name - Overwatch - is also the name of an upcoming superhero game. On the Earth 2 of the New 52 universe, Overwatch-One was the name of the personal spaceship of Terry Sloan. However, it is most likely it is a reference to the name of a novel by Arrow executive producer Marc Guggenheim. Another 52 reference - both Diggle brothers were part of the 52nd Regiment and 5th Battalion of the US Army. In the final flashback scene, Baron Reiter appears and is identified by Lieutenaut Joyner as "the boss". It is unclear, however, if he is the ultimately leader of Shadowspire or just the leader of that particular unit. The body of Alan Chang - the ARGUS agent who tried to make contact with John and Lyla - is found with one eye missing. John determines the body suffered multiple lacerations to the knees, a broken arm and had three fingernails removed. This suggests that not only was Chang tortured and question but that his eye was taken to get past the retinal scanners required to enter ARGUS HQ. Felicity is on a painkiller called Ketorolac. She says that the side-effects include swelling of the hands and feet, increased appetite, risk of infection and hallucinations. In the real world, Ketorolac is the generic version of a drug called Toradol which is frequently used as a pain killer following surgery and does indeed include hallucinations among its many potential symptoms. The security system at Shadowspire's base at Star City's docks includes motion sensors, laser trip wires and digital locks. ARGUS believes Shadowspire were plotting to steal a shipment of confiscated rail guns. Rail guns are special guns that fire electromagnetic projectiles. Just one is capable of destroying a building. The security monitors in ARGUS cell block work like TV sets, receiving broadcasts on the 700 mHz band. 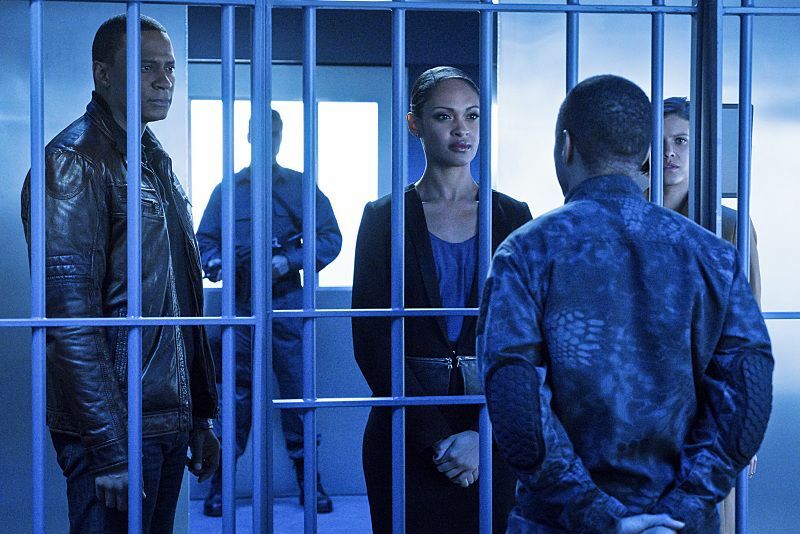 Diggle is able to switch the chip-set to transmitting mode, allowing him to send an image of the hostage situation in ARGUS to the Arrow Cave. Andy: How do you end up working out of a basement - or wherever we are - and fighting crime with a guy who wears a green hoodie? John: Well, he's a good man. And we're not fighting crime, Andy. We're taking a city that is holding itself together and we are helping. John: How the hell could I not see this?! You were with me the entire time! Andy: Because you saw what you wanted to see! Look, you wanted to believe that The Army had straightened me out. Look, I'm your brother but I'm not built like you! I didn't take to the military like you did! You saw the world as something to be fixed! I only saw it as broken. So I made sure I had enough to survive in it. John: So you pretended to be a completely different person around your brother? Andy: It spared me the look that's on your face right now. Goth Felicity: People wear masks for a reason. To hide who they are. Just like you have been doing for the past five years. First you decided to sign up for being the world's most over-qualified I.T. girl. And then you decide to try being a hero. And look what it got you? A ring-side seat to the rest of your life. Waller: It's nice to have you back, Agent Michaels. Feels like old times. Lyla: What feels like old times is you keeping secrets that get good people killed. Did it ever occur to you that Alan and the other two agents might still be alive if you hadn't tried to keep your anti-Shadowspire operations off the books? Waller: Of course it has. But the ugly side of our business is that sometimes security has to be paid for in blood. Lyla: Thank you. I was wondering why I'd left. Felicity: I was at home, feeling more self-pity than I have in my entire life when it hit me. This is who I am. I wanted to come along on your awesome superhero adventure because I wanted to help people. And the old me was so angry at the world. But that anger never accomplished anything. It just created more anger. And some seriously bad personal style choices. I wanted to do some good in the world. Felicity: That was a good speech. I thought you'd be a little more impressed! Felicity: - but, how did it go again? "If I know you, and I do, you're probably thinking what happened was your fault." I'm here to tell you that it's not. And that it's not mine either. It's the fault of only one man and he has an extremely on-the-nose and alliterative name. And we're going to stop him. Not out of guilt or vengeance or regret. We are going to stop him because it's what we do. That's who we are. Oliver: THAT was a good speech. Green Arrow: Overwatch? We're on site. Green Arrow: Well, I thought that it was time you got a code name. What do you think? Green Arrow: Was gonna go with Oracle, but it's taken. Shadowspire's standard tactics are based around misdirection. They will attack targets in order to draw attention away from their true goals. The organization even masquerades as an elite military unit, hiding its true nature as an organized criminal organization. Shadowspire's goal is the access codes to something called Rubicon. Oliver refers to the events of 408 and Barry's traveling back in time to save them all. Felicity's hallucination refers to the events of the flashbacks of 305 and her old boyfriend faking his death. Amanda Waller is killed by Lt. Joyner. Curtis Holt appoints himself as Felicity's personal driver. Felicity officially takes on the code name Overwatch. John and Andy Diggle were part of the 52nd Regiment and 5th Battalion of the US Army. Felicity refers to Amanda Waller nearly destroying Star City with a drone strike during the events of 223. Andy Diggle helps to steal confiscated heroin for Shadowspire. He is paid a generous bonus and meets "the boss" a.k.a. Baron Reiter, who tells Diggle that he traded the heroin for a map of Lian Yu. At the episode's end, Andy Diggle moves in with Lyla and John and is introduced to his niece Sara for the first time. The flashbacks focused on John and Andy Diggle are set in Helmand Province, Afghanistan in the year 2005. Amanda Waller is rather unceremoniously killed by Lt. Joyner. I suspect the reasons for this involve orders from Warner Brothers to eliminate the last vestige of Suicide Squad related material from the series, so there is no branding confusion when the Suicide Squad movie comes out this summer. While I can't say I'm going to miss the Arrow version of Waller, it still seems like The Wall should have gotten a bigger send-off than being shot in the head by the villain-of-the-week. A sedately-paced episode sold through the sheer quality of the core casts's performances. It is nice to see Felicity and John getting to share the spotlight for most of the episode after being so largely ignored during Season Three. And the separate subplots are starting to tie together nicely, with the revelation of Oliver's nemesis in the past having a connection to their current troubles as well as Andy Diggle's dark past. Had they played Felicity's receiving a code name straight and not fridged Amanda Waller so callously (though I suspect the show runners had little choice on that front), it might have been perfect.